Lead was the first metal to be extracted from ores some 9000 years ago. As the basest of the traditional seven metals, leads negative-Saturn properties are fairly evident. It has been used for bullets and tombs, and especially in England has a long tradition of poisoning the general populace. Wine and cider used to be drunk out of pewter goblets, and pewter then contained lead, and one dreads to think what effect this had. Nowadays lead still remains the one and only pollutant whose toxic levels overlap those found in the general population. For long the government showed a leaden inertia about investigating the problem. Saturnism was one of the first industrial diseases to be recognized, so named because its symptoms  headaches, fatigue, irritability and depression  seemed reminiscent of a saturnine humour. From brewing cider in pewter vessels, to using lead paint on houses, and lead solder in water supplies, the addition of lead to petrol was just one more link in a long tradition. In the 1970s, scientists finally became able to measure reliably the level of lead in the normal-population bloodstream, at around one or two-tenths of a part per million (Thats D7 in homeopathic terms). The idea that this could be impeding child intelligence and promoting hyperactivity seemed like science fiction. I was then working in the governments Air Pollution Unit in London, measuring city air lead levels. It dawned on me that these symptoms had a Saturnine character  as, equally, did the reason for putting the lead into petrol, which was to slow down the combustion-process and make it more regular. I participated in the great British lead debate which then erupted, and wrote a book on the subject, then finally apprehended that this debate had entirely revolved around the triple Saturn-Jupiter conjunction of 1980 (such triple events being very rare). The issue soon vanished from public debate, once the conjunction was over! Do we have a generation of heavy metal kids, with a witches brew of heavy metals a-jangling in their bloodstream, impeding their mental concentration? The prime culprits nowadays are aluminium, lead and cadmium  and, conversely, a deficiency of vital elements such as zinc, selenium, chromium and calcium. Any child growing up in an inner-city environment and showing a difficulty in concentrating, should be tested via hair, tooth or blood for such. This should be routine, and especially for any crime of violence where lack of self-control is involved. Yes it really, really is the case that a mere one or two tenths of a part per million of lead in the human bloodstream impairs central nervous system development in a growing child. Such things should be part of pre-conceptual care for responsible couples, who want a nice child. This basest of metals needs to be removed from the general environment. The trouble is, its so useful! Lead stores in the bone tissue. If you could see only that part of a person where lead was, youd see  a skeleton. Saturn-Chronos as old Father Time was traditionally a skeletal figure. It takes about thirty years to flush out bone lead, so its a fairly permanent affair. However one should not view this with leaden-eyed despair. No other metal tends so much to form insoluble compounds. It is a heavy, dark, sluggish metal, and of the seven it is the slowest conductor of electricity and the least lustrous or resonant. Lead exists as a boundary or limit of heaviness. To see this we need to look at the Periodic Table of elements, and there we notice that the elements above lead are radioactive, i.e. they are too heavy to remain stable. They decay, until they reach lead, then they stop. So various lead isotopes can be present in a rock, that are the end-products of radioactive decay. Broadly speaking, the more of these isotopes there are, the older the rock is likely to be. Scientists measure age by lead! They may take a ratio of uranium to lead, and from this proportion they will infer billions of years of age. This indicates Saturns connection with Time, though whether such inferred eons of lead time are real or illusory is another matter. When scientists looked at the moon rock, the most distinctive fingerprint they found was that of the lead-isotopes, from which they inferred its enormous age. 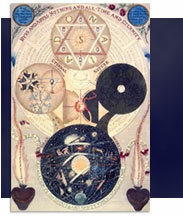 The Saturn-archetype is associated with the notion of a boundary or limit, which reminds us of this lead-property. Also, Saturn holds an hourglass: use of lead in paint is now banned, but no other white paint can last through the years like a lead-based paint. But, lead paint is still used for painting the yellow lines along the kerbside (lead chromate). Only a lead paint is tough enough! Here the lead sternly prohibits one from parking, over certain limited hours, which seems Saturnine enough. The planet Saturn displays a strong vertical axis, with its magnetic and rotation axes coinciding within one degree, and at a right angle to these are the rings, exactly level and circular. A plumb-line holds the vertical, leads earliest use (plumbum, lead Latin). Saturns gravitas is sometimes required to hold ones balance in life. Lead levels in human blood have been plummeting over the last two decades, right across Europe. The three ps piping, paint and petrol have all seen lead phased out and mean levels in blood are well below the one-tenth of a part per million (milligram per litre). So does that mean were in the clear? Alas no  being so insoluble, lead takes a long time to leave the environment. Anyone committing a crime of violence is likely to have something like four times more lead and aluminium in their hair then a normal person  thats a staggeringly large differential*. There is a very dark, negative side to lead poisoning and we need to understand this. Lead has one of the highest recycling rates for all materials, with 90% recycling for lead in batteries for many European countries. Demand for lead continues to grow. The lead industry has been struggling to counteract negative public perception of this metal and an enormous body of legislation has developed to limit releases of lead into theenvironment. TV sets and computer monitors use cathode ray tubes and to protect viewers and operators from harmful X-rays, the glass used for the cathode ray tubes contains 23% lead oxide. * Neil Ward (U. of Surrey) Heavy metal Status of Incarcerated Young Offenders , in Heavy Metals in the Environment Vol.2, Hamburg, 1995, 277-80.